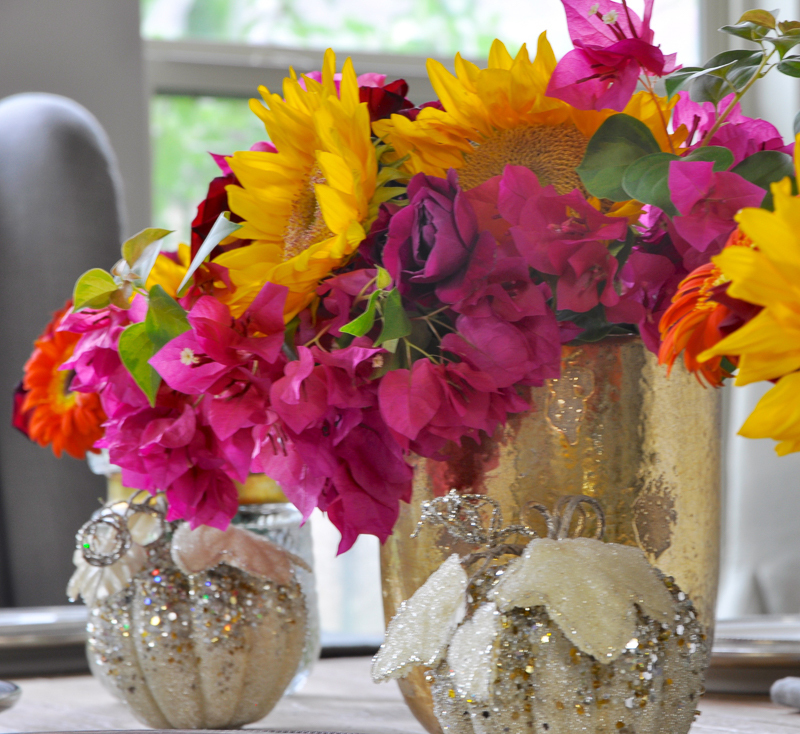 I recently hosted an evening bridal shower for a bride who loves vibrant colors. Here is a sneak peak, but a full dedicated post is coming soon. 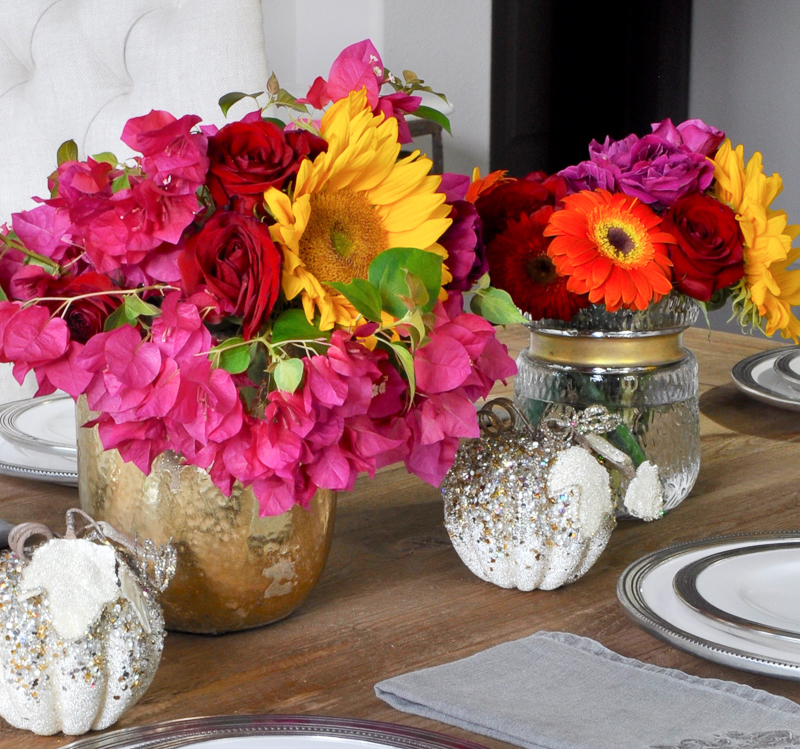 After the event, I had all of these beautiful flowers left over and I wanted to do something a little special, so I settled on a quick and easy table for an evening with friends. One of my best entertaining tips is to “stack” events. The house is clean, looking great, the flowers are still fresh, and it is quite easy to prepare extra food. Typically, I will host a more casual evening the second night. Living in the south, I have always struggled with fall decorating. I eagerly await that first blast of cool air long before it actually hits. Such is the life in south Texas. 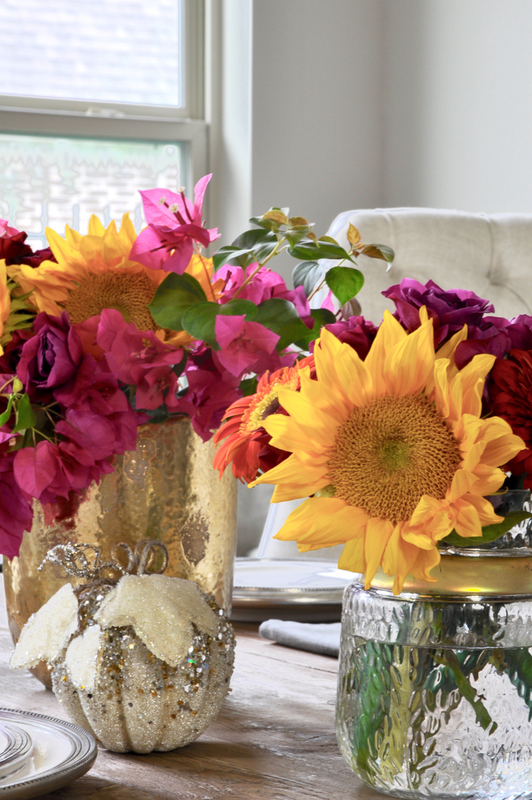 However, since I have a plethora of leftover flowers, I thought it would be fun to show you how you can combine seasons within your arrangements. Because the flowers are so vibrant, I chose to use simple white dinnerware (you can read more about my dishes here) and left the silverware and stemware in the kitchen. This meal was served buffet style and I wanted the focus to remain on the beautiful, bright arrangements. 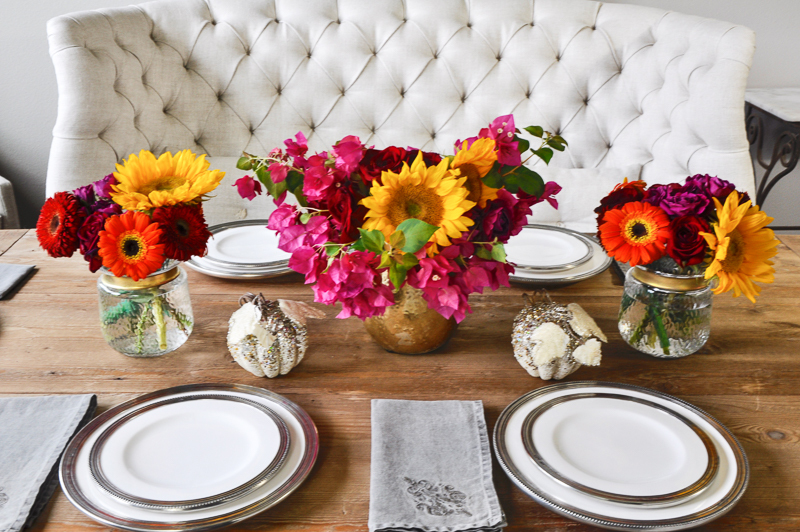 My fall representation consists of orange and red gerber daisies as well as sunflowers. 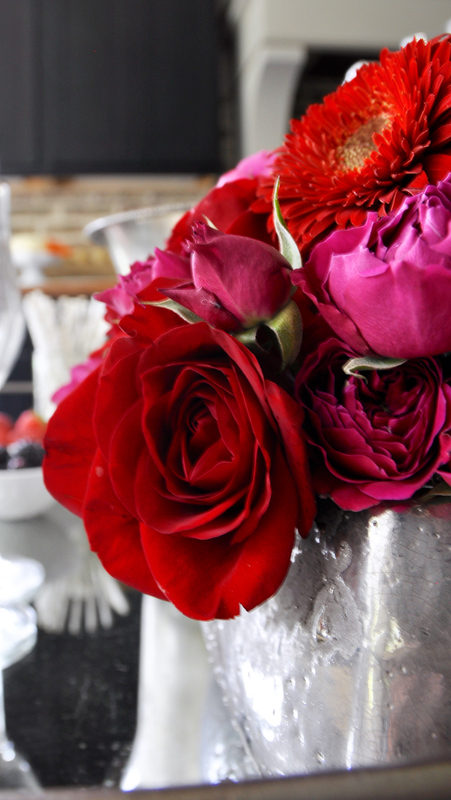 I also utilize red roses, which are absolutely timeless. 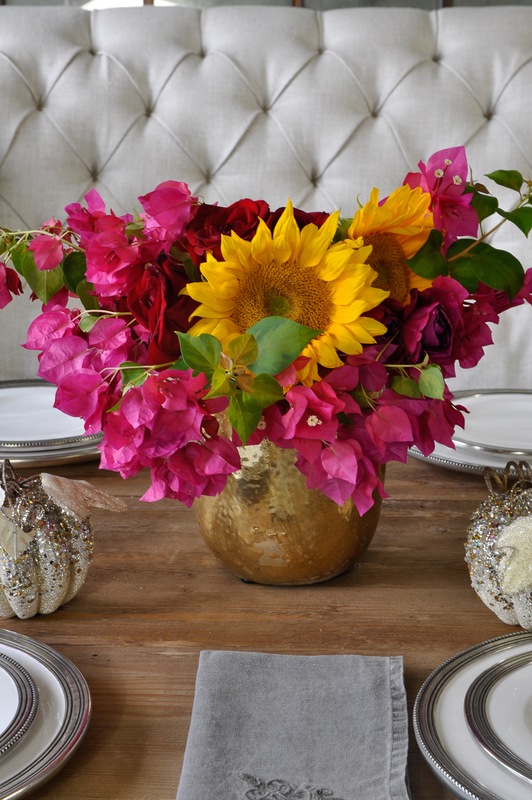 For a touch of summer, I added bright pink spray roses to the smaller arrangements and I included bougainvillea which was clipped from my back yard in the large arrangement. Which means it was free! For warmth, I used gold accents as well as a couple of glittery pumpkins. 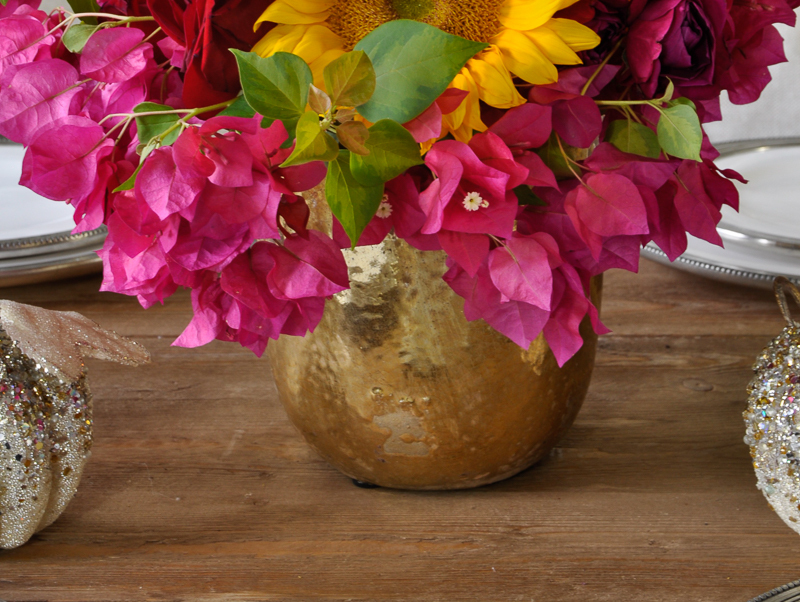 You can find my beautiful gold rimmed vase here and it is on sale! Because the sunflower, roses, and gerber daisies are more upright, I let my bougainvillea hang over the edges of my gold pot for a beautiful effect. So easy, yet such a statement! 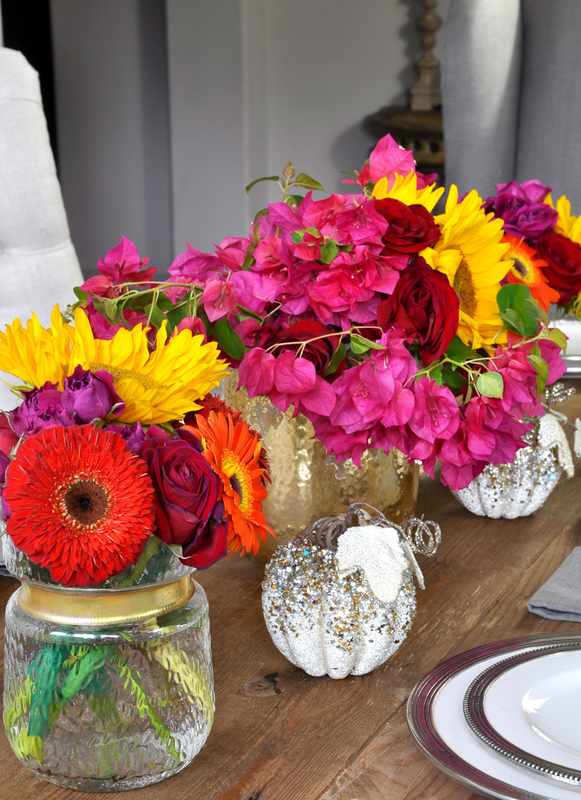 I hope I’ve inspired you to stack your next events so you can repurpose your flowers too! *You can shop my dining room furnishings here. Click images below to shop table! Jen, what a lucky bride! These are so so gorgeous! And against that neutral back drop… I want more! Beautiful colors in the floral arrangements. Thank you so much Janet!!! 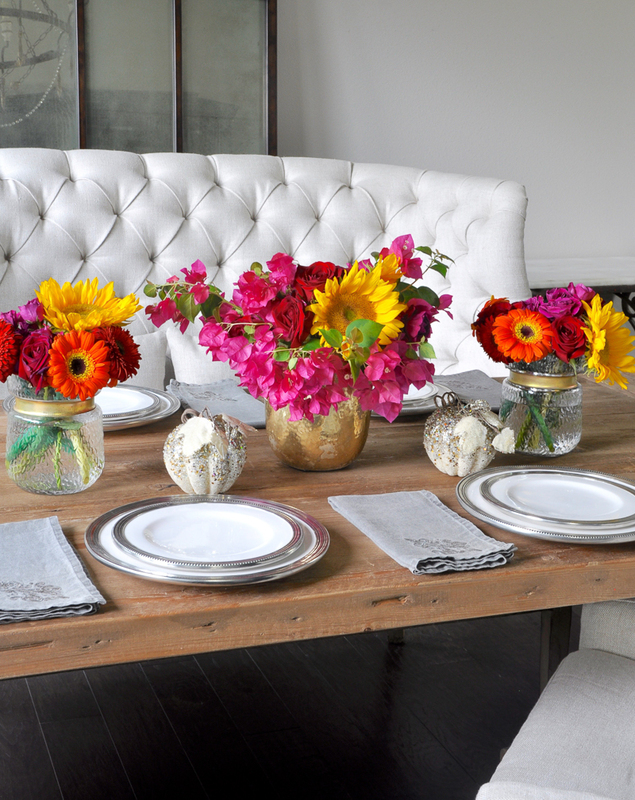 I love the colors and tablescape… Makes me want to hose a big ol’ party!! Thank you so much for your kind words and thank you for visiting my site! I hope you do have that big ol’ party!! !